If you come on holiday in Ibiza there is a series of dishes and typical products that you cannot miss. You can also buy them and complete them as a souvenir and proof of your trip to your friends and family. As we are very sweet and we want to leave it with a good taste in our mouth, we will start at the end. For the desserts! We leave you the ten most popular and traditional sweet desserts on the island of Ibiza. 1. Orelletes. They are a kind of ear-shaped biscuits with two elongated holes in the centre. They are made with flour, sugar, eggs, oil, anise, lemon zest, salt and "batafaluga" an aromatic herb. 2. Buñuelos. They are similar to small and soft donuts. They make a base of water, flour, milk, eggs, cinnamon and sugar. They are the traditional dessert in celebration or celebration. 3. Almond muffins. They are puff pastries, small and elongated made essentially with chopped almonds. It also contains flour, sugar, puff pastry, lemon zest, cinnamon, eggs, lard and sugar. 4. Ensaimada. This is a very common dessert in the Balearic Islands but each region makes them with its touch and more charismatic filling. The common element is this spiral-shaped round cake covered with sugar. It is made with flour, sugar, yeast, eggs and butter. From there, fill it with whatever you want! 5. Flaó. This dessert resembles a cheesecake. It is made with flour, water, lard, anise, lemon zest, fresh cheese, eggs, sugar and fresh mint. It is very common to eat it after lunch or just cut it in pieces for eat it as a snack, accompanying the morning coffee ... and so on until there is no crumb left. 6. Graixonera. At sight you can see the less beautiful dessert, but we do assure that it is delicious. 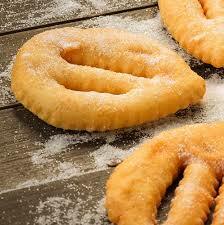 It is made with milk, ensaimadas, cinnamon, lemon rind, sugar, candy and eggs. As its name suggests, it is baked in a "graixonera" or clay pot. 7. Macaroni of San Juan. This dish can no longer be closed, around the San Juan fiestas, on June 24th, you can only eat at the restaurant. They are wavy macaroni made with milk, cinnamon, lemon rind, oil, sugar and cinnamon. They are served in a deep dish because are served as soups. 8. Christmas sauce. This is another one that cannot find it. It is made before Christmas day and is taken throughout the holidays. With a small and quick cup, enough time to do it. It is made with ground almonds, eggs, sugar, honey, cinnamon, cloves, salt and chicken broth. There are many variants and every time there are fewer people who have dedicated themselves to do the task that the process of elaboration is slow and requires patience. 9. Bizcocho or "bescuit pagès". It is an elongated cake, golden on the outside, white on the inside. Also they are typical in the Christmas season and the perfect accompaniment to the Christmas sauce. It is made with flour, milk, anise, lard eggs, yeast, sugar and lemon peel. 10. Ibizan herbs. To spend so much sweet it is necessary a good drink. It includes a good dose of Ibizan, an alcoholic beverage made from aromatic, sweet anise, all macerated for months. In each house a different way has been done for what is not to be seen, all the same things in the whole island.